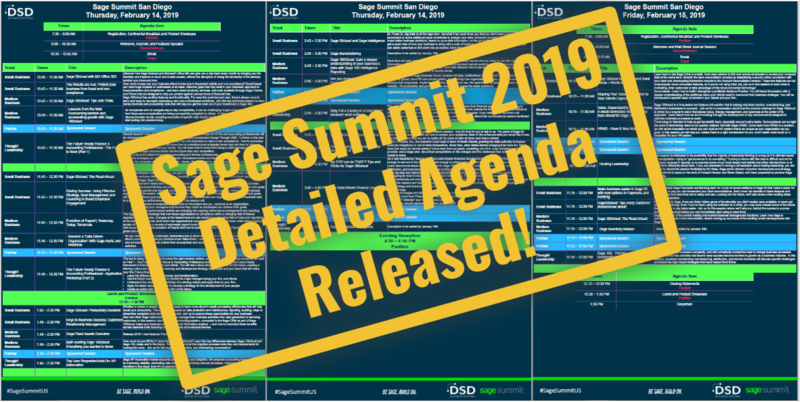 Sage Summit San Diego – Price Increase Next Week! Sage Summit San Diego is NEXT MONTH! If not, you have until next week to take advantage of the $299 price! Sage Summit registration includes an all access pass to all of the scheduled events as well as opportunities to network with fellow industry professionals and enjoy the beautiful San Diego sunshine. Pricing goes up another $100 on February 1st 2019! Register Today for ONLY $299! The most recent agenda released includes detailed courses descriptions and tracks specific to Small Business owners, Medium Business owners and those interested in Thought Leadership growth. There are also several opportunities for you to learn more about Sage Endorsed Solution Providers like DSD. There will be valuable sessions and opportunities for demonstrations of trusted Sage enhancements like DSD’s Multi-Bin Basic Module designed to work exclusively with Sage 100cloud. Refer to the Sage Summit FAQ for answers. Are you a DSD Client? Contact us today for a special discount code!